On February 12-13, 2019 game industry stars from all over the world will gather Berlin at the White Nights conference. Over 1,300 attendees are expected. King, Zeptolab, Twitch, Facebook, Appodeal, Ogury, Applovin, Nutaku, MediaCube.Agency, Nevosoft, Unreal Engine, Braavo Capital, Lab Cave, Xsolla, Adjust, VK, MoPub, and other leading companies have already confirmed their participation. The conference program is announced! Only 20 free booths left at the Developer Exhibition where 100 teams from all over the world will present their best projects. Every team participating in the showcase will receive an awesome mini-booth and 1 Premium Ticket for free + a good discount for team members! Let us know that you want to join the show by submitting the form https://goo.gl/forms/tB6c5t6R9ZlkLspg1 until January, 25. Developers can also take part in the Big Indie Pitch to be held by Pocket Gamer on Day 2 of the conference. The unique speed dating format will give each developer some time with each panel of experts, meaning entrants will get real feedback from the event and a chance to win prizes! More info and registration on the official website. There’s still time to grab a 10% discount off the Early Bird rate by using the promo code IMGAatWN10. 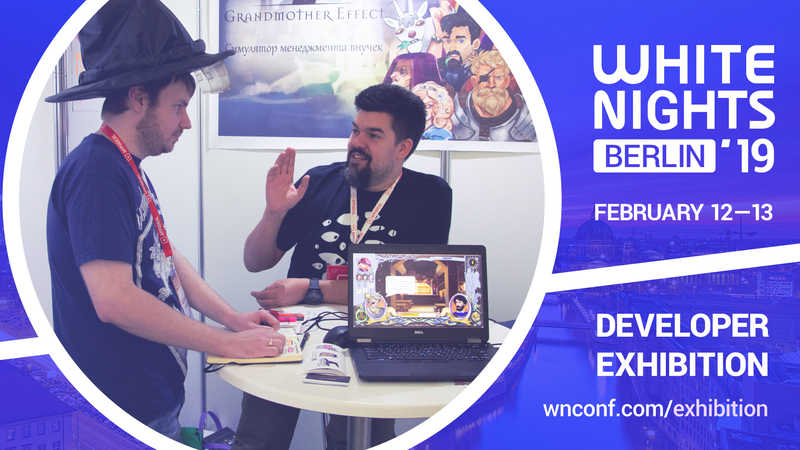 Feel free to contact the White Nights team at welcome@wnconf.com for any questions.